Tidel TACC Cash Management Systems | Highly reliable. 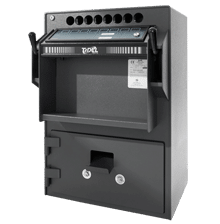 Since its introduction in 1978, the TACC (Timed Access Cash Controller) from Tidel has become the standard for deterring robbery and improving cash handling processes for thousands of retail locations in over 50 countries worldwide. The TACC family has evolved since this time, and is now comprised of the TACC IIa, TACC III, and TACC VI. All TACC products provide a simple, user-friendly interface, easy-to-use cash dispensing, receipt drop operations, and high reliability, all in a cost effective solution. 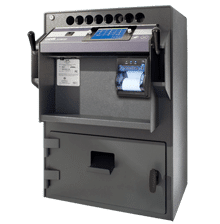 The most recent addition to the TACC family, the TACC VI, provides new and innovative features such as a 7-inch color screen, integrated tube vend module, note validator maintenance door, and a choice of two manual drop vault options. 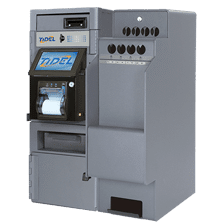 The Tidel TACC family minimizes everyday accounting burdens, allowing your managers and employees to spend more time with customers and less time managing money. The TACC IIa provides a secure and cost effective way to manage an organization’s in-store change fund and facilitate manual drops. Leveraging a built in electronic time delay, the TACC IIa enables the dispensing of tubes of notes or coin to enable the making of change right at the register. The TACC IIa has two drop manual drop chutes, and a user-friendly interface. The TACC III leverages the convenient features of the TACC IIa and adds an expanded audit trail via a built-in user console. The touchscreen interface allows managers and cashiers to quickly record deposits and make change while keeping an accurate count on each day’s transactions. All activity is auditable via individual user PIN. The TACC VI is the latest addition to our world-renowned TACC product line. The TACC VI offers new features and functionality that enable retail organizations to effectively secure and manage their daily cash transactions, including a single note validator, an integrated tube vend, and an integrated console with a 7-inch color screen. Interested in the TACC line of products? Contact us today.